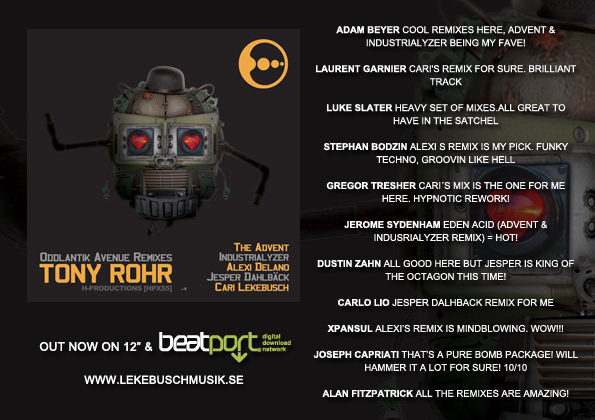 Having originally released Tony Rohr’s Oddlantik Avenue album back in February, Cari Lekebusch’s H-Productions have done what they do best and clubbed together between their tight roster of like-minded artists to come up with a eye-widening selection of reworks for this remixes EP. Left to their own devises to pick what tracks to remix, the individuals’ own tastes came to the fore. The Advent unsurprising opted for the twisted techno killer ‘Eden Acid’ while Cari Lekebusch jumped at reworking the crazily tripped out ‘RZ-Fun’. Alexi Delano’s low-slung mix of ‘Nightdrive’ is beautifully melancholic and Jesper Dahlback made Oddrangement into a disorientating soup of deeply intense moods and fizzing percussion.